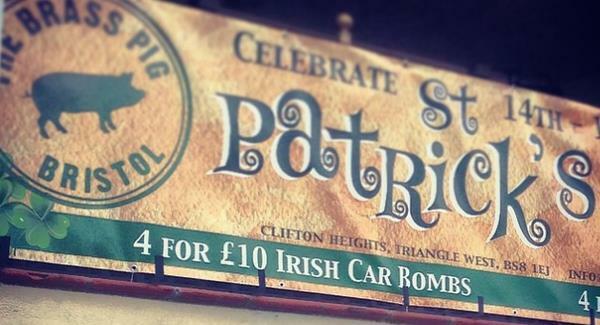 ‘Irish Car Bomb’ cocktail banner banned at UK site of two bombings. Duh. A banner advertising “Irish Car Bomb” cocktails at a pub near the sites of two 1970s bombings in Bristol has been censored. The Brass Pig pub put up the banner to promote its St Patrick’s Day celebrations. Local author and journalist Maurice Fells, who covered both attacks as a journalist, said it was “unbelievable” considering the area’s history. Pub officials said the advert was “wrong” and have now covered it over. Bristol was bombed twice, in 1974 and 1978, on sites near to the pub.